Coventry Sharks make it into two national cup finals as the men win through to the final of the National Shield, joining the women who will play in the National Cup final. 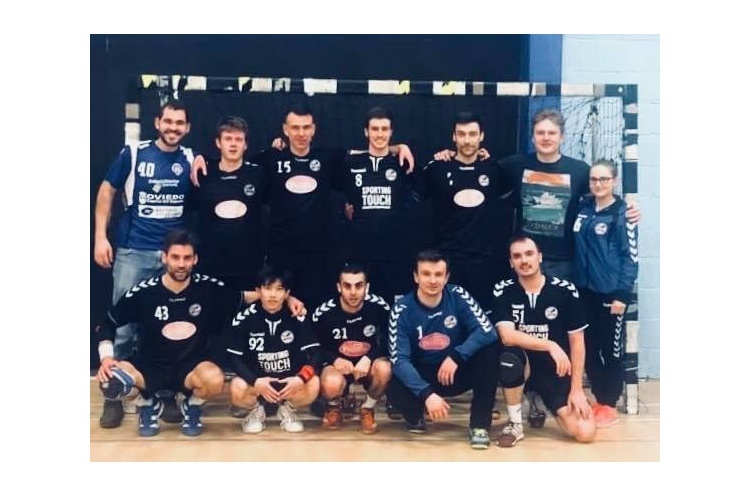 In the England Handball Men’s National Shield, Sharks beat Reading Lions 56-35 in a high-scoring match, with Guildford narrowly overcoming University of Loughborough 33-31 in the second semi-final. Sharks put 40 goals on the scoreboard during their quarter-final, and continued that astonishing goal scoring trend in the semi-final. Roaring out into a significant 29-18 lead by half-time, Sharks extended this in the second half for the stunning 21 goal margin of victory by the final whistle. Milos Pospiech top scored for the hosts, netting seven times; Kiril Tankov replied for Lions with 10 of his own. This astonishing goal scoring performance by Sharks will set them up for the final where they will meet Sabres. It was a far closer affair between Sabres and the students of Loughborough, with just one goal separating the two teams at half time. A flurry of second-half goals from Sabres’ Fabio Goutet and Allan Jard saw them squeak home by two goals. Sharks will face Sabres in the National Shield final which will be held on finals weekend at Derby Arena on the weekend of 5/6 May. Will it be another flurry of goals from the Midlanders? Or will the Sabres grind out a tight victory like they did against Loughborough?